The Travelling Lindfields: The Abrolhos Islands with Shine Aviation: Stunning snorkelling and the bloody story of the wreck of the Batavia. 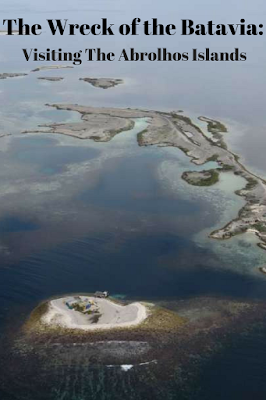 The Abrolhos Islands with Shine Aviation: Stunning snorkelling and the bloody story of the wreck of the Batavia. A few hours before dawn on 4 June 1629, the Dutch East India Company ship the Batavia, struck Morning Reef off the Abrolhos Islands, Western Australia. The Batavia was neither the first nor the last ship to come to grief in the treacherous waters off Australia's uncharted and unforgiving west coast but the tragic fate of her survivors has ensured she is the best known. The story of the Batavia. The Batavia set sail from The Netherlands in late October 1628, on her maiden voyage. She was the pride of the Dutch East India Company's fleet, purpose built to sail the Spice Islands' trade route between Europe and Java. She was carrying passengers and crew of 340 men, women and children, the vast majority of whom were Dutch East India Company sailors, or soldiers in the company's private army. She was also carrying a small fortune in silver coins. The Batavia was doomed from the moment she struck the reef but it was not the shipwreck which took the lives of her passengers. In the days before she broke up, about 250 of those on board were ferried to nearby Beacon Island in the ship's longboat. Leaving these survivors to their fate without food or water, and abandoning several score more still aboard the sinking wreck, the Commander Francisco Pelsaert, the skipper Ariaen Jacobsz, and most of the ship's officers set out in the Batavia's longboat. Their ostensible purpose was to look for water on the Australian mainland. When they found none, they headed instead for Java, a journey across some 900 nautical miles of open sea. The most senior Dutch East India Company employee left on Beacon Island was Jeronimous Cornelisz. In the next few months he and a band of followers conducted a reign of terror which saw some 125 men, women and children murdered. On September 17 Pelsaert returned with a rescue ship, the Sardam, arriving in the middle of a battle between Cornelisz's men and a small group of mostly soldiers, led by Wiebbe Hayes. 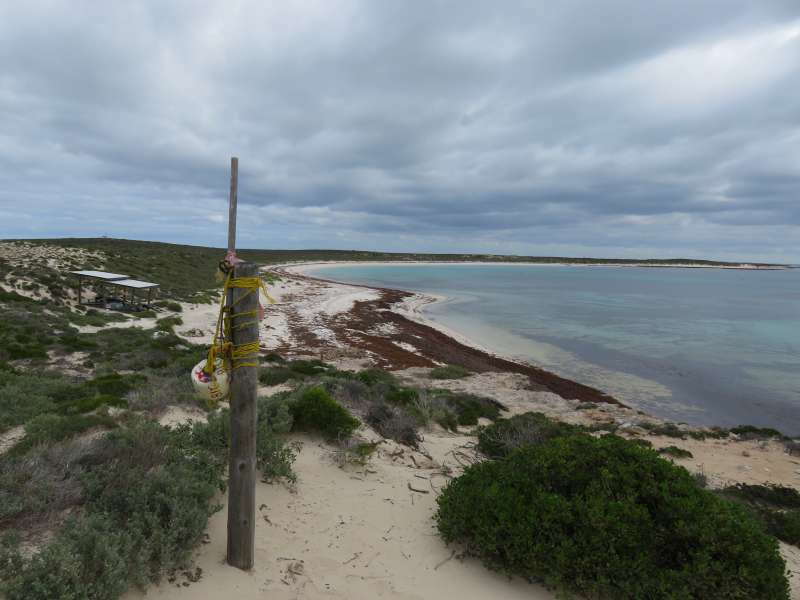 Hayes and his men were camped on nearby West Wallabi Island. Both sides raced to be the first to reach the Sardam: Cornelisz's men to take control of the rescue ship and Hayes to warn it. Hayes arrived first. Cornelisz and his followers were arrested and the few survivors left alive were rescued. The great tragedy of the wreck of the Batavia is that Cornelisz very nearly didn't make it off the foundering ship. Forty men went down with the ship when she sank a few days after striking the reef. Cornelisz was one of those trapped until the very last. He floated ashore onto Beacon Island with part of the wreckage. Before she struck the reef, the Batavia was already in danger. Led by Cornelisz and the skipper, Jacobsz, a group of Batavia's crew were planning a mutiny. Lured by the prospect of the fortune in silver she was carrying, the mutineers planned to seize the ship, take the silver and live out their lives as pirates out of reach of the Dutch East India Company. It may have been the prospect of being found out as mutineers which led Cornelisz and his followers to begin their murdering rampages and to hatch their plan to seize any rescue ship. When Pelsaert returned with the rescue ship he tried and executed most of the mutineers while still in the Abrolhos. He also marooned two men on the coast of Western Australia. If they survived they would have become the first Europeans to 'settle' Australia. Stories of light skinned aborigines surfaced from time to time over the years, leading to speculation that these men or survivors of other shipwrecks did survive to make their lives with aboriginal groups in the area. 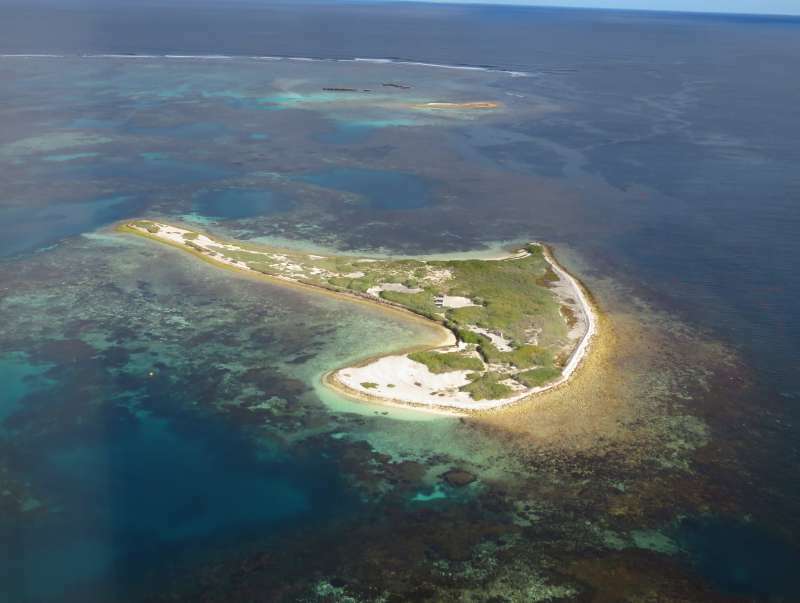 Has the story of the Batavia whetted your appetite to see the Abrolhos Islands? What if I threw in some of the best snorkelling I have ever done, and the chance to see whales, wallabies and nesting ospreys. "If you don't see it the first time, don't worry, I'll bring the plane around again." 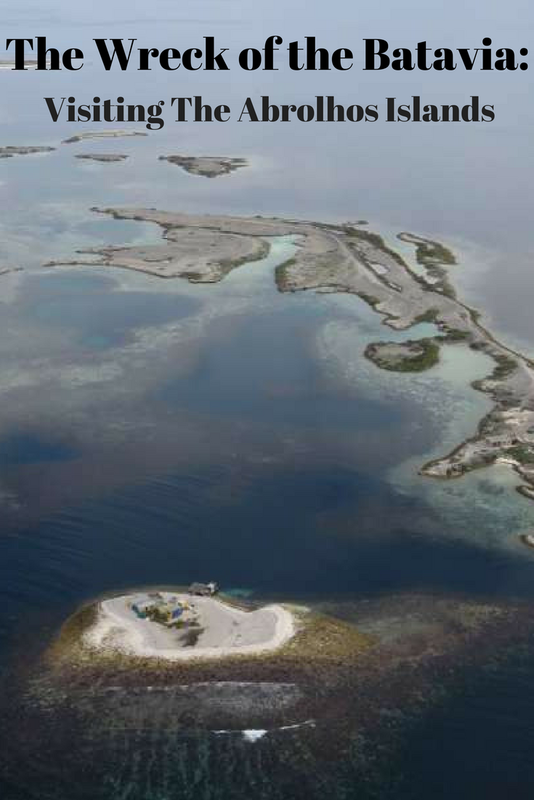 With those words ringing in our ears I completely missed the stone fort built by Wiebbe Hayes and his men as we flew over West Wallabi Island. True to his word Dylan, our pilot, brought the GA8 Airvan around for a second, lower, pass. This time everyone saw it. The fort is little more than four dry-stone walls but it is the oldest European structure built in Australia and seeing it was a rare privilege. Dylan was exactly the sort of pilot you want on a flightseeing flight. He cared whether we had a great day or not and he flew low enough over each sight so that everyone on board got fantastic views. Whales - So many migrating humpbacks that I finally gave up counting. Beacon Island - This was where most of the survivors of the wreck lived until they were murdered one by one by Cornelisz and his followers. The spot where the Batavia struck the reef and sunk - What is left of the Batavia is now in a museum in Fremantle but we were able to make out the outline of where she rested for three hundred years before being found and raised. 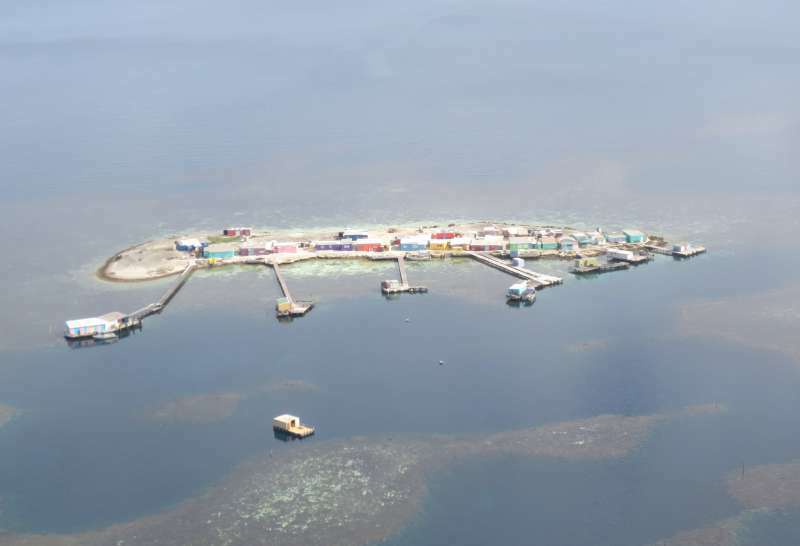 Other islands in the Abrolhos Group and the stunning tourqoise blue waters surrounding them - Many of the islands are dotted with brightly coloured fishermen's shacks. The shacks look like scattered lego from the air. Can you see the fishermen's shacks? Imagine living, even for a few months, on an island as small as this. An hour so so after taking off from Geraldton we landed on East Wallabi Island. Wiebbe Hayes and his group spent some time here before wading across to West Wallabi Island at low tide. This was the 'flipper' part of our Fly & Flipper Tour. We had been kitted out with snorkels, masks and flippers before we left while those of us planning to snorkel also hired wet suits. In early August, on an overcast day, I wasn't taking any chances on being cold. The snorkelling was nothing short of stunning. The coral is less than 100 metres off the beach and has some of the most vibrant colours I have seen. Since doing the Fly & Flipper tour I have snorkelled on the Ningaloo Reef at both Exmouth and Coral Bay. The Abrolhos coral was infinitely more colourful, especially around the left hand side of the coral outcrop Dylan directed us to. The bay where I went snorkelling. It had an aura of Robinson Crusoe about it. A short walk after lunch rounded out a perfect day. Dylan guided us along a path to where he hoped to find some of the tammar wallabies which inhabit the island. As if on queue we found several of the little creatures grazing on low bushes. 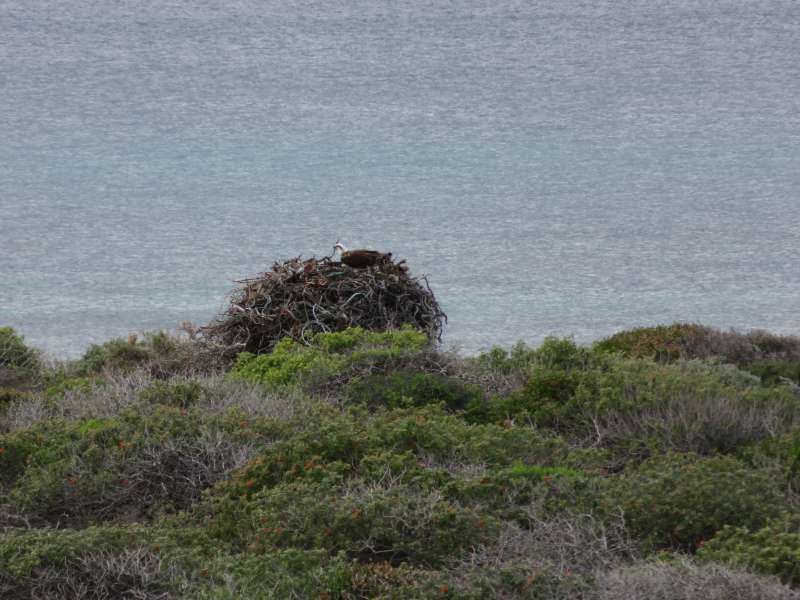 Further along we saw more migrating whales and watched an osprey, sitting in a huge nest right next to the shore. The coral is stunning. Any swimmer of moderate ability can reach it from the beach, but don't be concerned if snorkelling isn't your thing. David didn't go snorkelling and he still had a great day. Brush up a little on the story of the Batavia before you go. The Museum of Geraldton has a great Shipwrecks Gallery with an extensive display on the Batavia, as does the WA Shipwrecks Museum in Fremantle, near Perth. There are also a few books on the story including the very readable 'Batavia's Graveyard' by Mike Dash. Shine Aviation's Fly & Flipper Tour departs from Geraldton (a four hour drive north of Perth) at 10 a.m and returns at 4.15 p.m. Morning tea, lunch and snorkelling equipment is included. The cost is $360 for adults and $290 for children between 3 and 12 years. There is a half day version if you are short of time. For up to date times, prices and other tours with Shine Aviation click - here. Would I recommend Shine Aviation? Yes - without a moment's hesitation. The Fly & Flipper Tour was one of the best flightseeing tours we have ever done. Note: I have read several different accounts of the story of the Batavia. None of them agree exactly on the numbers of people who were on the ship when it left the Netherlands, how many made it to Beacon Island, or how many were murdered by Cornelisz and his followers. Note: David and I received a media discount on the Fly & Flipper Tour. What a great story. I'd love to do this trip. Any possibility you put up an itinerary of your whole WA trip some time. Would love to see it. I am intending to put an itinerary up once I have finished the individual posts. I know it looks like just one trip but we have actually come to W.A twice in recent months. The first time we went to the Kimberley and then a few weeks later, after a quick trip to Queensland, we came to Perth and drove north to Exmouth. We have done so much travelling this year my head is spinning and I am way behind on blog posts but stay tuned, I am determined to finish off W.A before I start posting about upcoming trips. Interesting history along with spectacular snorkelling and a private guide ticks my boxes. I will look into Fly & Flipper if I make it out to the west side of Oz again. It was the best flightseeing tour we have ever done. David is on notice that I want to do it again next year! Oh my heavens what a bloody story indeed Lyn. shocking how people can turn on each other. I feel so sad for the women and children in that horrid situation many centuries ago. Your description here and on Facebook makes me want to jet over straight away. It seems this area of Australia is far less tourist heavy. I shall certainly come back to your post should we head down under again. Perth, the capital of Western Australia is one of the most remote large cities on earth and its isolation carries through to the rest of the state. There are tourists, but you can still get a feeling of being on your own very easily. The story of the Batavia is awful. It is so hard to understand how a group of people could turn on their fellow human beings in that way. on a more cheerful note: the wallabies look adorable (and a bit like kangaroos) and I'm in for the coral! Wallabies and kangaroos are very similar. Larger wallabies are often mistaken for kangaroos and vice versa. I am sure they are related but I am no expert. It is funny you should mention the Lord of the Flies because that is exactly what I thought - Lord of the Flies in real life. Also not my favourite book. I was made to read it at school otherwise I don't think I would have got much past the beginning. I love reading travel blogs because I learn something new everyday. Wow! I've never heard this story but how interesting and heartbreaking. And the snorkeling and isolation and kangaroos on the beach! I with you on travel blogs - you learn so much. Apparently the story of the Batavia was quite well known in Holland at one time but even in Australia a lot of people have never heard of it. I read about the story of Batavia, years ago, however it would be very different when you actually see the islands. I first read the story many years ago and re-read it before we went to the Abrolhos. It was really interesting being on the islands where it all took place. The Batavia is a story which even a lot of Australians are unaware of. We had a great day discovering where it happened. Seeing the whales from the air was amazing. I just loved it but even without the whales it was a fantastic day. Western Australia is a long way from everywhere but that is one of the things which makes it so fascinating. Wow, that's so interesting to have seen that, as in The Netherlands we learn this story at school!! I am really interested to hear that you learn the story in school. I knew that the story was well known in The Netherlands when it first happened but I didn't know it was still well known. I had never heard of it until I visited the museum in Fremantle where what is left of the Batavia is on display. It was one of the best day's sightseeing we have ever done. I just loved it. Looks like an incredible adventure and that snorkeling sounds wonderful. I love anywhere with a great teeming reef. If you love coral reefs, you should come to Australia, we practically specialise in them. The snorkel portion is what attracts me. Wish I would have known about this tour when we were in Perth; it would've been a 'must do' for us. We prefer activities where are physically active. Sorry to say that the history portion has no draw for me - too difficult to retain all that information. If we ever get back to Perth, we'll check it out. 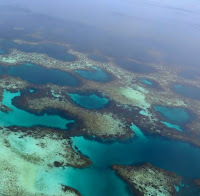 Know that we dove all over Australia and then in Fiji; Fiji's corals win hands down! I haven't snorkelled in Fiji for decades. Fiji was a cheap travel destination when I was young and like many young Australians I did it to death. I can recommend the coral off East Wallabi Island (Morning Reef) - it is just stunning. I have also found parts of the Great Barrier Reef to be really beautiful, particularly off Lizard Island. Lizard is a long way off the coast though and expensive to stay on. I was less impressed with the coral on Ningaloo Reef (further north on the Western Australian coast) than I expected to be but it was easy to reach. You literally just walk off the beach. Somewhere down the track I intend to write a post on all the spots we went too. Really fascinating Lyn because I learned a bunch about the Dutch East India company when doing my homework for a Bali trip, and when reading a book about the horrific volcanic eruption on Kraktoa East of Java, I am pretty sure that was the book. Absolutely amazing how much of the world these Dutch explorers saw, as they were pioneers in many ways. Maybe not too nice after the explorations but I do admire their fearless spirit. The Dutch were the first Europeans to discover and visit Australia. They were sailing past, and crashing into, the Western Australian coast 150 years before Captain Cook discovered the east coast. When I was at school we learned about Dirk Hartog, a Dutch sailor, who landed on an island off the west coast in 1616 but I didn't know, until I went to Western Australia, that he was just one of many Dutch sailors who saw the coast. The reason they ended up there was that without the ability to accurately calculate longitude they would get the roaring 40s winds behind them and go much further east en route to Java than they intended. What an odd mix of horror and beauty! And what a scary story - had one man insane with greed not made it ashore, perhaps the whole group would have survived. A few people died of thirst in the first days on Beacon Island. Most survived however because it rained on about day 6. Apart from them and about 40 sailors who never made it off the sinking ship the others could have easily survived. 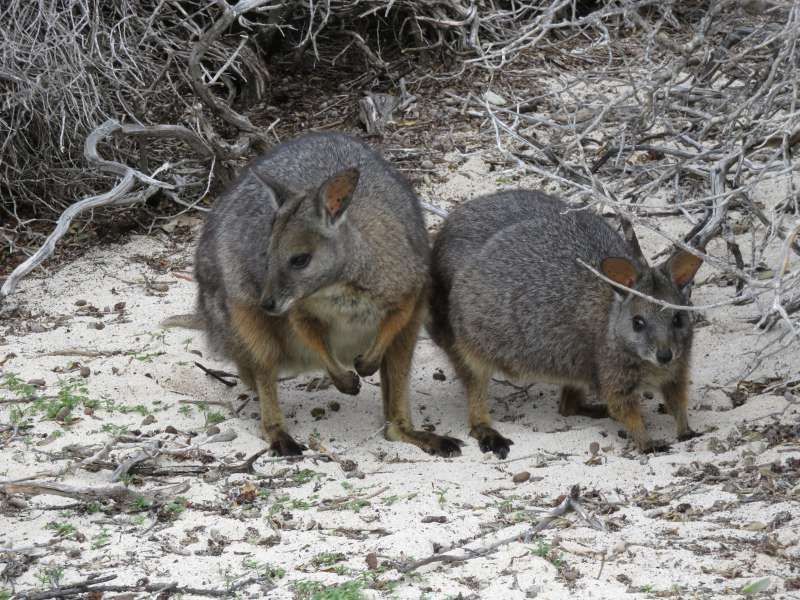 Once water and an abundant source of food (the wallabies) were found on West Wallabi Island it would have just been a matter of waiting for the rescue ship. 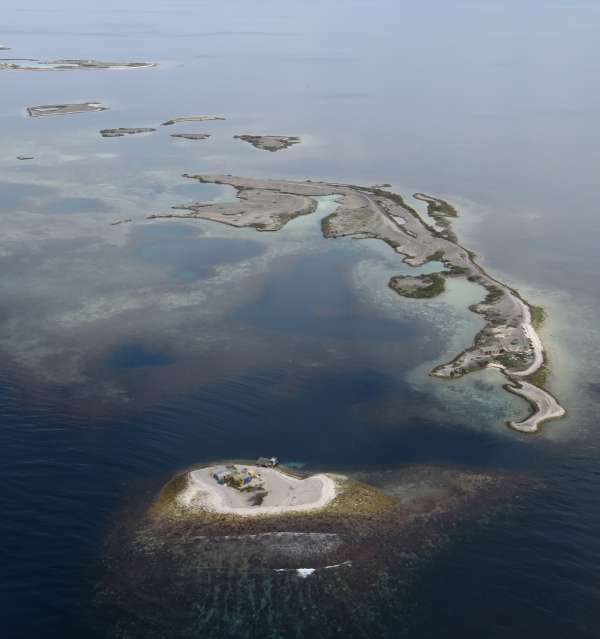 The Abrolhos Islands look pretty incredible! The photo of the fishermens' shacks is remarkable. Thx for sharing. The shacks were great fun to see from the air. I don't know why they were so brightly coloured but I guess it was in an attempt to brighten up an otherwise monotonous environment. I would definitely love to visit Beacon Island, Lyn! Thanks for the awesome post! What shouldn't we miss there? I only flew over Beacon Island. We landed on East Wallabi Island. You can probably get to Beacon Island by boat but there isn't an airstrip as far as I know. If you go to East Wallabi, don't miss the coral. I love when there is some history and intrigue involved! Sites like that are always more engaging and enjoyable. Adding some snorkeling and wildlife just makes it better! Oh, and migrating whales? That would be fantastic to see! Sounds like an awesome day. Thanks for sharing it on #TheWeeklyPostcard. It was a stunning day. I am already planning a return visit. I know what you mean about a bit of history. I am thinking about adding a section to posts about a new area titled 'Books to read' because a bit of background always makes a place so much more interesting. Did you know there's a full replica of the Batavia in Holland? It was made according to the original design. It's moored in Lelystad and is open to the public. It's amazing that people trusted their lives to ships like that for such vast distances! I knew that there was a replica of the Batavia built and I knew it was in Holland but I didn't know where. I would love to see it. Apparently it sailed to Australia some years ago - so people still trust their lives to ships like that. I guess it has better navigation equipment on board than the original Batavia. The main reason the Batavia and so many other Dutch East India Company ships were wrecked off Western Australia was that in the 1600s and early 1700s mariners were unable to calculate longitude. Many went faster than expected, with the roaring 40s behind them and ended up hundreds of nautical miles east of where they thought they were. Wow, the story of the Batavia is an incredible tale. What a nightmare for the shipwrecked passengers to have made it to shore only to meet a gruesome end. It was really such a tragedy. If if wasn't true you would say it was almost unbelievable. What an interesting and tragic history of the island. I'm glad the snorkeling and wildlife makes for an even more interesting visit. Love those photos from above. I am a snorkelling tragic. I explore under water whenever I get the chance but I must say that the Abrolhos had some of the best coral I have seen.